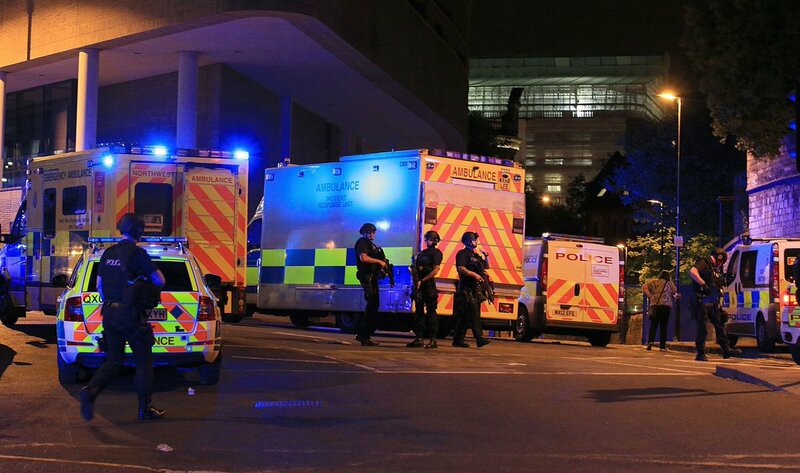 Late last night at the Manchester Arena in the United Kingdom, at the Ariana Grande concert at 22:38pm, after she had performed her last song of the night, an explosion rang out in the packed out venue, sending concert goers fleeing from the impact, whilst many were caught in the cross fire of an improvised explosive device “nail bomb” by a terrorist suicide bomber. The suicide bomber detonated himself, killing 22 people, many children, teenagers, adults and injuring so many more, with the 59 injured so far, many are expected not to make it. Theresa May and Jeremy Corby have suspended campaigning in the UK election, as a result of the horrible attack. We here at Brainstain, are sickened and appalled this morning by this horrible news, we are extremely upset and are very angry, and this once again proves the ideology of radical Islam, which needs to be eradicated, including their places of worship within the United Kingdom, that harbour ties to extremism and terrorism via radical Islamic clerics who prey on the young and the impressionable, promising them 72 virgins in Islamic heaven with Allah. At Brainstain, we believe that no longer should political correctness, denial and pattering and pandering to Islam be on the agenda, it needs to stop, immediately! Politicians and World Leaders everywhere need to start speaking out about radical extremist Islamic terror and many socialist governments need to investigate terror cells and deport and eliminate anyone from their countries, that even slightly send off warning signals to their support of the radical extremism of Islam, not only in Europe, but across the whole world. Mosques and places of worship in the United Kingdom, we believe, should be under investigation and under closer scrutiny, as many harbour the ideology of Islamic Extremist views in certain areas, where they teach that all non-believers should be killed. Much more work needs to be done to prevent this dangerous Ideology of Islamic Extremists, and needs to be monitored further on the Internet, in the communities and in Mosque’s across Europe and across the whole world. At the Manchester Arena last night, which holds a total capacity of 21,000, they found nuts and bolts, nails and shards of metal strained across the floor of the whole venue.